As the temperature soars and the humidity rises, residents of the five boroughs sweat it out in a citywide sauna. When you’ve had it up to here with the heat, say bye-bye Big Apple, hello New England seaside getaway. Consider a weekend retreat to coastal Rhode Island, where the Atlantic breeze is as refreshing as a Popsicle on a sultry July day. Overheated city dwellers have a wealth of waterside options for car-free coastal vacations close to home, but few hold a candle to Newport. It has been a honeypot for urbanites since the Gilded Age, when it was a summer playground for millionaires. Nowadays, you don’t need to be a millionaire to enjoy Newport and you don’t need a car to get here. Strolling or biking is the best way to soak it all in. 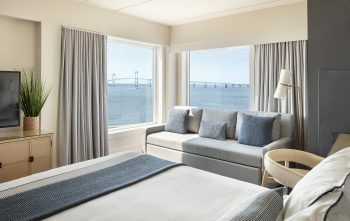 Gurney’s Newport Spa and Resort opened in 2017. Perhaps you’ve heard of its beach-chic sister resort in Montauk at the tip of Long Island’s East End? The Rhode Island property is every bit as fetching as its older sibling. 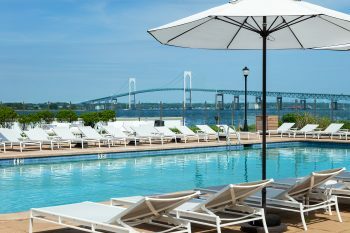 The Newport hotel is located on Goat Island with majestic glimpses of water everywhere you turn. 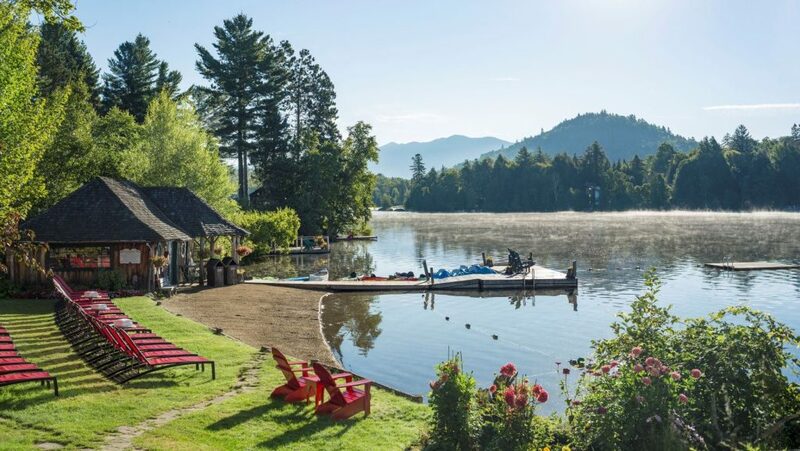 This serene island is just a few minutes walk across a causeway from the town’s best attractions. For an extra dose of aquatic fun, ride the water taxi and appreciate Newport Harbor’s scenery from a prime vantage point. Uncluttered rooms are furnished in a rainbow of soft hues with accents of natural textures. Maritime touches capture the town’s nautical spirit. Rooms with expansive water views may trick you into thinking you are on a boat. Speaking of boats, the resort features their own 22-slip marina. The outdoor pool is a winner, with live music every weekend, so don’t be surprised to witness impromptu dancing inspired by kicking back a few frosty summer cocktails. For an added dose of fun, there are poolside fashion and lifestyle pop-ups between Memorial Day and Labor Day. If the weather isn’t cooperating, the indoor pool is an alternative. They don’t call it Goat Island for nothing. A visit with the resort’s adorable resident goats can be arranged. 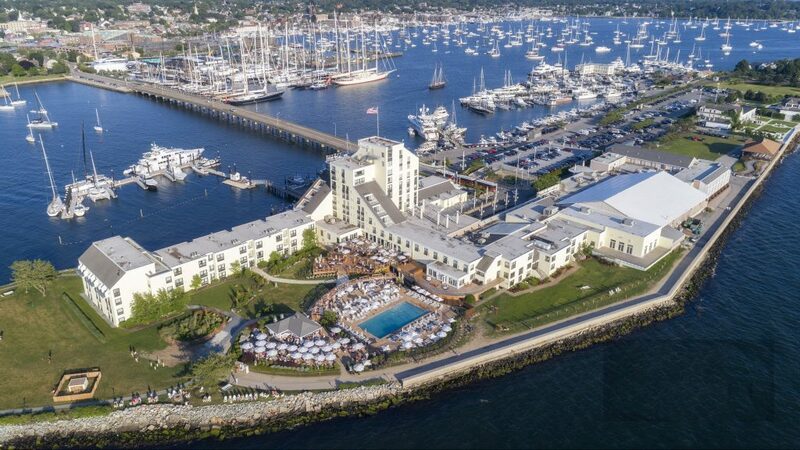 If you’re drawn to the water, Newport is a sailor’s heaven rich in yacht racing lore and America’s Cup history. You’ll see Topsiders, Oxford shirts and Bermuda shorts everywhere you turn. 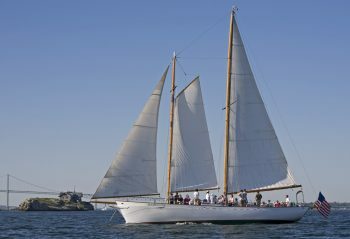 Experience the power of the wind and sail aboard one of the many yachts that the dot the harbor and offer cruises to the public. 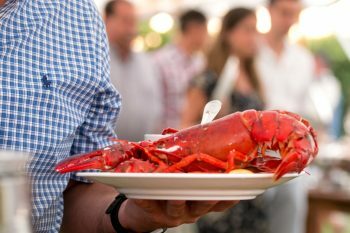 If your favorite way to experience the sea is through your sense of taste, boat-to-table dining options are plentiful. Oysters, clams and assorted crustaceans brim with brine and the kiss of saltwater. The Newport Shipyard is just a few minutes walk from Goat Island. Boating enthusiasts should enjoy being surrounded by seaworthy vessels. 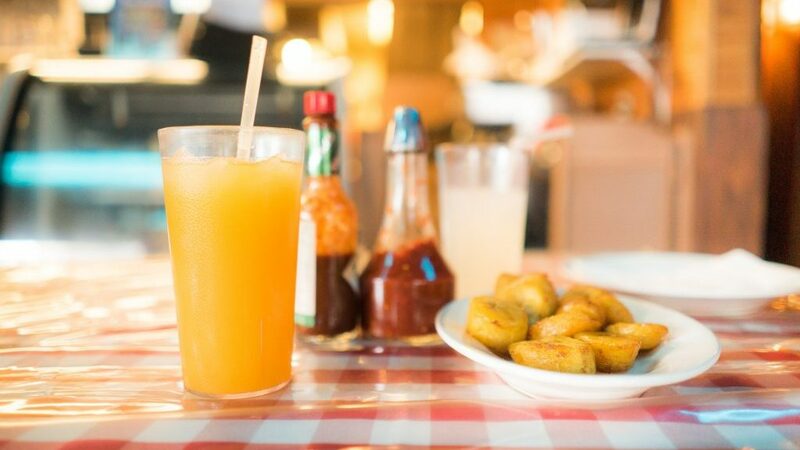 Casual Belle’s Café is located inside the shipyard so you may enjoy dockside dining. You won’t find friendlier service or a better breakfast. You place your order, pay and choose a seat. They’ll let you know when your meal is ready. The buttermilk pancakes are as fluffy as pillows and served with maple syrup. Crab cakes Benedict is made with organic poached eggs and zesty lemon-herb Hollandaise. For lunch, you can’t go wrong with twin lobster rolls loaded with fresh lobster meat and bound with just a dab of mayo. If you can’t bear to leave the cocoon of the resort, dining options at Gurney’s are delectable. Order the unofficial Rhode Island state dish, calamari. 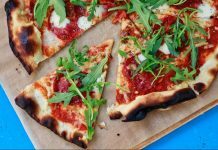 It’s a crispy treat with just the right accent of chili sauce for heat. It pairs perfectly with the craft cocktails served at the Regent Lounge. For active visitors, Newport overflows with recreational options. Cliff Walk is a 3.5-mile path with panoramic ocean views on one side and Gilded Age mansions on the other. Fort Adams State Park is home to a massive fortress standing guard at the entrance to Narragansett Bay. 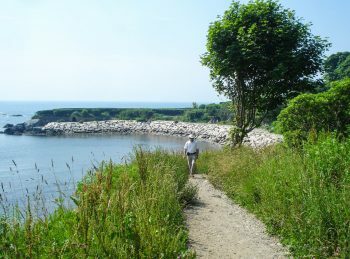 Hike the 2.2-mile Fort Adams Bay Walk for picturesque views of boats and lighthouses. The town is famous for two world-class summer music festivals, Newport Jazz and Newport Folk. Both events draw top-caliber performers and an international crowd. Catch the new seasonal ferry from Providence to Newport. Ride Amtrak or the bus to Providence and transfer to the Seastreak ferry for the one-hour ride to Newport. Inhale the sea air and gaze at the Narragansett Bay from the deck as the coastal scenery floats by. Enjoy high speed wifi, spacious seats and a full-service cash bar during the journey. The ferry runs from late May through mid-October.